Varro wrote a book on farm management ( Rerum Rusticarum Libri Tres) that suits my climate. Sadly, to the extent that his instructions are timed by reference to the rising of specific stars, it is of more value to those in the Northern hemisphere rather than me. Still, I cast an eye over his advice as the seasons change. "XXXIII. During the fifth season between the rising of the Dog Star and the autumn equinox thresh your straw and rick it, continue the harrowing of your fallow land, prune your fruit trees, and mow your irrigated meadow the second time." And, indeed, I have attended to those tasks, in my own way. 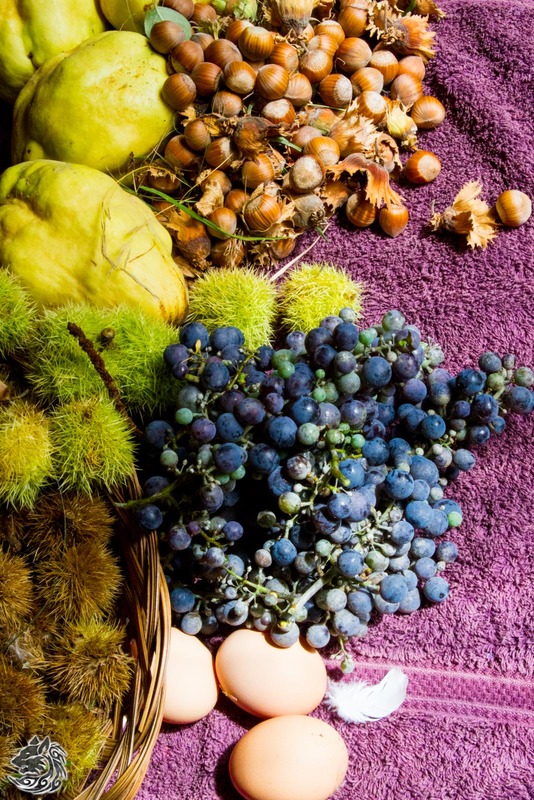 Today I also harvested chestnuts, hazelnuts, quinces and the last of the wine grapes (which I have decided to dry this year to eat with cheese, fig and flat breads when the cold comes - I have already stored the figs). LIX. The pome fruits, like the preserving sparrow apples, quinces and the varieties of apples known as Scantian, and 'little rounds' (orbiculata) and those which formerly were called winesap (mustea), and now are called honey apples (melimela), can all be kept safely in a cold and dry place when laid on straw, and so those who build fruit houses take care to have the windows give upon the north wind and that it may blow through them: but they should not be left without shutters for fear that the fruits should lose their moisture and become shrivelled by the effect of the continuous wind. The vaults, the walls and the pavements of these fruiteries are usually laid in stucco to keep them cool: thus rendering them such pleasant resorts that some men even spread there their dining couches: as well they may, for if the pursuit of luxury impels some of us to turn our dining rooms into picture galleries in order to regale even our eyes with works of art [while we eat], should we not find still greater gratification in contemplating the works of nature displayed in a savory array of beautiful fruits, especially if this was not procured, as has been done, by setting up in your fruitery on the occasion of a party a supply of fruit purchased for the purpose in town? Some think best to dispose their apples in the fruitery on concrete tables, others on beds of straw, and some even on flocks of wool. Pomegranates are preserved by sticking their twigs in jars of sand, quinces and sparrow apples are strung together and hung up, but the late maturing Anician pears are best preserved in boiled must. Sorbs and pears also are some times cut up and dried in the sun, though the sorb may be easily preserved intact by keeping them in a dry place: turnips are cut up and preserved in mustard, while walnuts keep well in sand, as I have explained with respect to ripe pomegranates. There is a similar way of ripening pomegranates: put the fruit, while it is still green and attached to its branch, in a pot without a bottom, bury this in the earth and scrape the soil around the protruding branch so as to keep out the air, and when the pomegranates are dug up they will be found to be not only intact but larger than if they had hung all the time on the tree. Perhaps if you have persevered to this point you will know why I spend my time with Varro rather than any number of modern agriculturalists. Here is a recipe for a good life. A fascinating read;I wish I could sample some of your produce!